Purple-red robe. A very expressive nose that opens with notes of chocolate and spice, followed by citrus fruit and white flower aromas. There are also hints of pure fruit, reminiscent of freshly-picked, crushed grapes. On the palate this is a clean and lively wine with subtle notes of small red berries and scrubland herbs. The tannins are elegant, discreet and well-integrated. The balance and originality of this wine gives it its “cuvée rare” status. 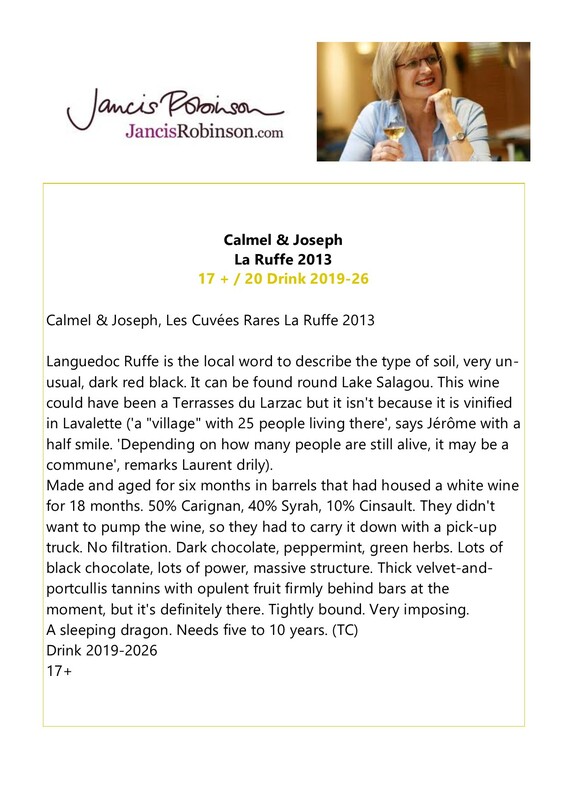 Clay limestone and blood-red “ruffes” soil typically found in the Terrasses du Larzac. Francis Lagarde, close to Bergerac, makes truly great wines. Warm, garnet colour enhanced by soft plumy fruits. Medium to full bodied displaying smooth and round overtones and a lingering finish. Plummy dark fruit flavours combine with subtle toasty notes. A medium to full bodied wine, displaying smooth overtones and a lingering finish. Maison Louis Jadot Monthélie is a very fruity wine developing red fruits and cherries aromas. It is a well structured wine with good tannins. It is quite a powerful yet still very delicate wine. It will be a perfect partner for red meats (roasted, grilled or in sauce) as well as cheeses. This wine exhibits a lovely mix of red and black berry fruits with further complexity gained from oak spice. These characters are balanced by soft tannins, balanced acidity and a fruit-driven finish. This wine highlights the slightly cooler season with lovely perfumed dark red forest berries and cherry fruits along with a hint of dried herb, adding complexity. The wine has a sweet berry entry which displays these same characters in abundance. Lovely ripe textural tannins rise gracefully out of the mid-palate to finish the wine. These are balanced by the wine’s acidity and fruit, to produce a long fruit-driven finish. Bold flavours of blackberry with hints of smoky vanilla backed by beautifully managed and balanced tannins having been traditionally aged in french oak barrels for fifteen months. ‘Dried cranberries and pomegranate are fruity yet demure on the nose. Bold flavors mimic the fruity aromas on the palate, juicy and tart. A well integrated vanilla and toasty coconut flavor perfumes the finish, with a slightly leathery kick.’ – 92pts. Excellent, Highly Recommended, Ultimate Wine Challenge 2017. Aromas of blackberry and raspberry fruit with a touch of fragrant wild flowers, vanilla and spice from its ageing in French oak. The palate reflects the nose with a silky texture, a richness of flavour and good freshness. Serve at 16-18ºC. Serve with roasted meats such as game or beef. Crushing and total destalking of the grapes. Pre-fermentative maceration at controlled temperature of 15 ºC; Fermentation in stainless steel tanks at 23ºC and maceration for 2 weeks. Before being bottled, the wine ages in new French oak barrels for 12 months. A blend of Tinta Roriz, Castelão, Syrah and Alicante Bouschet create a medium-bodied, rich and lingering wine with smooth tannins which envelope ripe black fruit. Enjoy with sausages and cheeses. Enjoy over the next couple of years. Harvest 2013 of White Castle Vineyard Regent grape variety delivered wonderful dark berry aromas and flavours, producing a medium bodied, deep coloured quality red wine. The rich dark cherry aromas and flavours are complemented by the subtle use of French Oak barrels. The result is an elegant and complex wine with a long smooth finish.